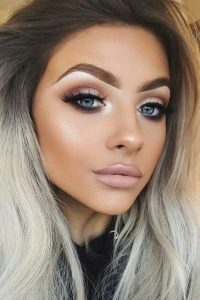 Individual Lashes have become essential cosmetics for the beauty female, However , in our pursuit of curly big eyes at the same time, but also often false Individual Lashes bring a variety of drawbacks. In fact, as long as the purchase, use and removal of three steps to pay more attention to avoid Individual Lashes on the eye skin damage. Terrier: the finer the better, black cotton stems and transparent plastic stems are a good choice, soft and toughness is better. Roots: the root of the hair to have a certain cross, so as to form a thick eyeliner effect. End: Naturally coarse-to-fine changes from root to shoot, like real Individual Lashes, slender ends look more realistic. Hair quality: soft hair flu, the most taboo plastic reflective feel of hair, one will wear to help. 1.Firstly, blow the hot eyelash curler clip and curl your own eyelashes, remember not to blow eyelash curler too hot. Tips: This method must remember to choose a good false eyelashes glue but not hurt the eyes. As the inner eyelid more moist,Individual Lashes coated glue can be about 20 seconds to dry after the glue on the eyes, remember to paste close to the real eyelashes, so as to be more natural and comfortable! 2.Carefully coated with mascara up and down. 3.Cut the trimmed false eyelashes into 3 short paragraphs, and then paste false eyelashes from the end of the eye piece. 4.If you want to create a sense of enchanting make-up, add a bunch of Individual Lashes at the end of the eye, you can create the charm like Ayumi Hamasaki big eyes’. Shake the eye and lip cleansing lotionfirst, and then stick the eye and lip cleansing lotionon the cotton swab. Use a cotton swab, light rub on the false eyelashes! Remove the liner a little bit, do not hurry to pull it down! Lightly flip on the eyelids, using a cotton swab, push the Individual Lashes from the bottom up, you can easily remove the Individual Lashes. Lastly, use a cotton swab with eye and lip cleansinglotion to remove the remaining glue on the eyelashes!